The micro/nanospray source we currently offer is a source insert for the Thermo Easey-spray source, PST-ES-M-N. It is nicked-name “Jailbreak 2.0” because it allows the user to use any columns including those with fittings at both ends, which are suitable for the higher flow-rates in the microflow regime. Sheath is also available to help desolvation of the ions to enhance sensitivity at these higher flow rates. The heart of the micro/nanospray source that enables the source to achieve nanospray sensitivity at microflow flow rate is our newly-developed patent-pending PST-mTip emitters. These metal spray emitters perform especially well in negative ion mode, and also the spray is stable throughout the gradient from 100% aqueous to 100 organic. 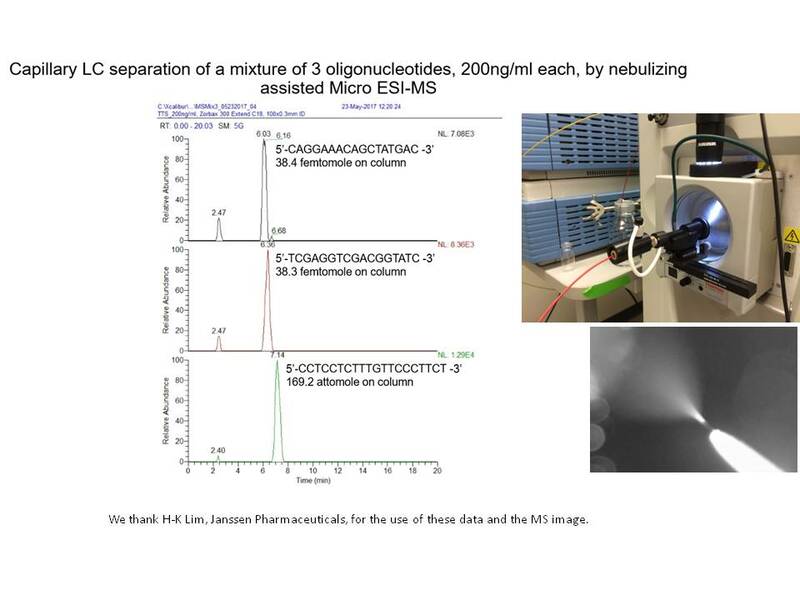 In the near future, we plan to offer the micro/nanospray source inserts for other nanoLC-MS sources such as the Thermo NanoFlex and the Sciex Nanospray sources. Please check back with this page about our progress in this development.